One of the (several) problems with the lighting in my XJSC when I acquired it were the two rear courtesy lamps. I popped them out and found that the switch assemblies (the lens itself is the switch), were broken at one of the pivots: the little metal-clad plastic nub was sheared off. Both switches suffered this same problem. First, remove the lamp assembly. This is easily accomplished - the wiring harness uses a form of bullet plugs, and all you have to do is unplug them. Note that there are two conductors on one side (the switch side), and a grounding wire on the other. One of the hot conductors is wired to the door/courtesy lamp circuit, and the other is 12V constant. You probably want to make note of what wire goes where, but it should be easy enough to figure out when you have the switch fixed anyway. Examine the switch assembly - if yours failed the way mine did (and which it appears to be the one real weak spot), then the side where the two hot wires plugged into the assembly is the one that is loose. Things to look for are the small metal bearing and pressure spring (on the hot lead side) - these provide the "click" and switch detent. Chances are, the bearing is missing, and the spring may be as well (though in my case, I am happy to report that the springs had remained in the assembly for both lamps). If not, retrieve them and don't loose them. An envelope or zip-lock baggie is a good place to put these small parts, though I have a collection of clear plastic parts bins (6.5"W x 12.5"L x 3.5"H) which I use. A quick look around the mounting location of the lamp, or brushing it with a telescoping magnet (I've a neat mini-flexi lamp with magnet tip that works well for this) might turn up the bearing or spring if they're missing. Take a pair of needle nose pliers (my needle nose Leatherman(tm) tool worked wonders here) and gently pull the lower spring (spring metal - not a coil spring like in the switch itself) on the grounded side of the assembly towards the middle of the lamp, while pressing down on the top of the spring (so you don't torque it too much on the plastic lens). This is so that you can get to the metal sleeved pivot pin that is in the housing on that side. Pull out the pin and set it to the side in your parts bin. Now you should have the metal sleeve exposed (specifically, there's enough room to get at it from the side -- no pin occupying the middle). Take the tip of your needlenose and carefully pull out the flaring (a slight bend inward), stopping to rotate the sleeve every 2 or 3 crimps so that you keep the part you're aligning on the open side of the ring (versus the side right behind the faceplate, which interferes with the pliers' straightening motion). When you've got the flare crimped out, you should be able to push the sleeve back through the pivot hole towards the lens, where it will pop through (or at least far enough back to clear the pivot hole to permit the lens to come free of the frame). Remove the lens from the frame. I did a bang up job on my first sleeve, so I took a metal-tipped disposable pen and removed the ink and tip from it, and used the metal tip of the pen and the pliers to carefully form it back into a proper circle, until I could insert and remove the sleeve in the lamp housing pivot hole to my satisfaction (I also did some light deburring with a sanding disc on a Dremmel). 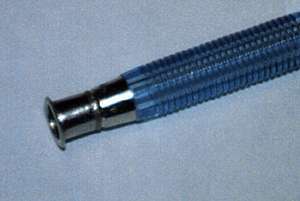 A carpenters nail countersink tool could accomplish a similar reforming job on the sleeve. Now, you need to take the broken plastic pivot pin (from the other side of the assembly) and the lens and carefully drill a hole into them (this is for reinforcing them against a repeat of the shearing - if you simply epoxied or superglued them back, they'd eventually break again). In preparation for this, I got a couple of fine finishing nails (1/16" diameter), and using a Dremel(tm) tool with a grinder bit attached, ground off the sharp points until they were both basically flat. I switched bits to a sanding disc, and sanded the burrs from the tip (not rounded, just nothing to catch on the plastic). First, with a felt-tip marker, mark the centre of the pivot pin and the shearpoint on the side of the lens. If you'd like, you can use a pushpin to make a slight divot at that marked spot (start with the broken off tip first - don't divot the lens just yet). The slight divot is helpful in providing a natural resting spot for the tip of the drill when you start drilling. Insert a 1/16" drill bit into the Dremel (or equivalent drill tool), and drill into the broken-off tip first (reason: it is MUCH easier to make a positional error here because the part is so small, and as such, you can then turn around and offset the hole you'll drill into the lens housing, where you have more control, to compensate). Hold the tip firmly in a pair of pliers or in a vice (but be careful not to apply so much pressure as to cause it to deform or collapse). Drill down about 3/32 to 1/8" (there isn't much plastic here to work with to start). Take the deburred tip of the finishing nail and insert it into this hole and see how snug it is. Now, switch to the lens housing and drill into it (repositioning the mark and using a pushpin to divot as necessary - if you're off centre, note that the tip probably didn't shear precisely flush to the lens -- remove the peg and mount it as if you were fixing china and trying to line it up right). Note that from the side, you can see how far your hole has gone into the plastic -- I'd suggest you stop drilling about the point where you've got about 1/16" inch left of lens before you've drilled all the way through (to get a more snug peg fit, and to keep the metal pin from even possibly making contact with the hot lead assembly - a no-no if you've drilled the tip to the point of making contact with the metal -- you could conceivably ground out the hot leads to the body when the lamp is switched on), though drilling all the way through shouldn't hurt. Clip the finishing nail to approximate length, and try a test fitting to see how well aligned the pivot is. With the sanding or grinding wheel reattached to the Dremel, finish the peg to length and deburr it. After a test fitting, prep the surface sheared area of both the lens and the pivot, plus a bit extra in the hole with superglue (if it isn't real snug), and assemble. The hard part is done - and if you've done a reasonably good job of drilling and gluing, the part is now actually BETTER than new - with the finishing nail dowel in the pivot pin, the part is protected from risk of future shearing. spring: I would have thought that a spring from an "old-style" push-click cheapo pen would work, but it is too large. Pop it open, steal spring, cut to fit. This spring looks to be something you'd order from Small Parts, Inc (1 800 220-4242), and they'd probably have the bearing too. Unfortunatley, I didn't measure my springs when I had them out, but the spring comes flush to the top of the hole it rests in, so take a wooden match and sit it in the hole, mark it and remove it to get the length. 1/4" seems about the size. Fairly stiff. bearing: copper/brass BB's (not pelets - BBs) may work. Sporting goods store might have some, or that old Daisy Model 103 sitting in the back of your closet might have some left in it. Your auto parts store might have some bearings this size - they might also have a spring too. The bearing is 1/8" diameter. If you've got at least one complete lamp, pull it out and take it with you to the parts counter and see if they can't match the bearing visually - even when assembled, the bearing is quite visible. 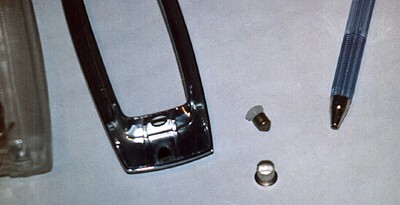 Insert the spring into the plastic frame (there is a small recess between the two contacts), and set the bearing on top of that (note that is is most easily accomplished with the frame face up). Take the metal sleeve, if you've completely removed it from the lens, and jiggle it into place over the pivot hole (on the lens, just under the ground spring), and use needlenose pliers to get it in (this is fairly easy to do if you've reshaped it properly). Press it into the pivot hole until it aligns with the outside of the hole. Drop in the pivot pin, and re-bend the backing spring (reapplying sufficient pressure on the backside of the pin to push the tip through the sleeve, being careful about the torque you're placing on the riveted-through lens). Holding the frame and lens above your parts tray (in case you should drop the bearing), insert the lens from the bottom side of the assembly, rebuilt pivot side first, down onto the bearing. When the side of the sleeve (with tension on it from the grounding spring) contacts the side of the frame, take your finger and press it down until it clears (there isn't THAT much spring pressure on it), and then slide it in. Align the lens such that the sleeve pops through the pivot hole in the metal frame, and you're home free. Apply power to the assembly and test. When you're sure it works, remove power and carefully reapply a flaring to the pivot sleeve, and reinstall (note, the proper reinstallation would be to insert the hot side first (since that isn't a spring pivot), and then push the springy side in). My cabin lights now work like new.